The Petzl Podium is the most popular industrial rope access seat currently available. 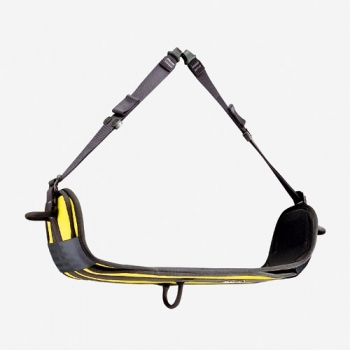 Designed for prolonged suspension work, it has a wide and rigid seat which is very comfortable and that can easily be adjusted while hanging in your harness. It furthermore provides excellent stability and has three gear loops to cater for gear & tools. The Petzl Podium Seat is an excellent choice for any suspended and prolonged work situation and will arguably provide a safer work position at height, as it may prevent the onset of Harness Suspension Trauma. Three sturdy gear loops for tools etc. We supply a full range of height safety equipment from Petzl so if you would like to enquire about this or any other item in the Petzl range, please contact us by calling 02 4784 2224 or complete our equipment enquiry form. * Please note: Prices given are in Australian dollars and are inclusive of GST. Discounts are applicable for large quantity orders or institutional organisations, please enquire. You may incur an additional charge for postage and handling. Prices are subject to change without notice. Please note that adequate training and judgment are needed to reduce the risks inherent in the use of this equipment. It is the responsibility of the purchaser to ensure that the user is adequately and competently trained in the use of this product. We strongly advise that you do not use the ASAP without first undertaking appropriate training.